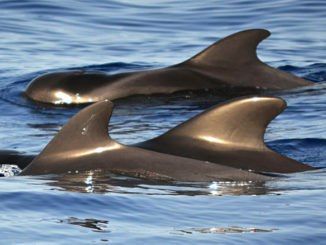 Top ten beaches on Tenerife? It’s a subjective and occasionally emotive subject. Everyone has their favourites. In many discussions I’ve read, these tend to be the ones people are most familiar with. People quote places as being the ‘best beach’ without having set foot on many of the island’s other beaches. 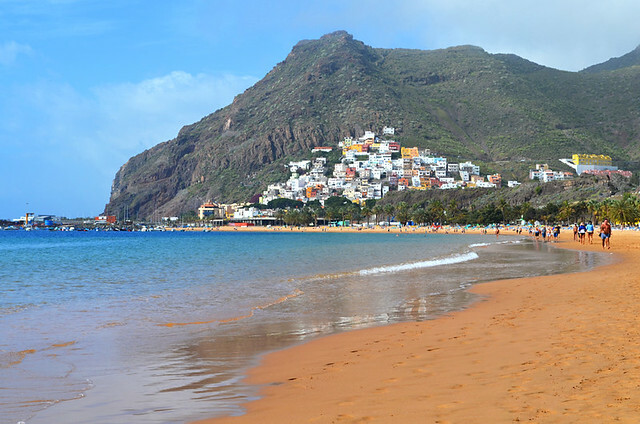 We’ve visited beaches all around Tenerife’s coastline, from the ones everyone knows about to coves that require three hours of trekking to get there. But we’re as subjective as the next person. We prefer beaches with a distinct personality that aren’t backed by hotels and which don’t have row upon row of sunbeds lined across them. Which is why this is called ‘Our’ Top Ten Favourite Beaches on Tenerife. Although the wide golden sands of Playa las Vistas just doesn’t do it for us, we can see how attractive it is as a holiday beach. There’s loads of space, it’s pale golden and therefore looks good, and there are lots of restaurants and bars nearby. But it’s just too manicured; it doesn’t feel like a real beach… which is why it comes in at number 10 on our list. One of the few places where you’ll find a naturally pale golden (ish) sand beach on Tenerife. Abades charms because it has a remote cove feel to it and is blissfully quiet outside of summer months. 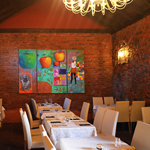 It is a complete contrast to the immaculately designed resort beaches. And it has a mysterious abandoned town behind it that adds interest. The development beside it is bland and not particularly aesthetically pleasing which knocks the beach down to ninth position. In some ways this is our favourite beach of the main southern resorts. Playa el Camisón lies tucked in between Los Cristianos and Costa Adeje. Because it’s on a headland it doesn’t feel crowded by hotels and benefits from having the five star retro good looks of the Sir Anthony Hotel behind it. It feels smaller, more intimate and more natural than other beaches in the area. The downside is that it gets very, very busy. 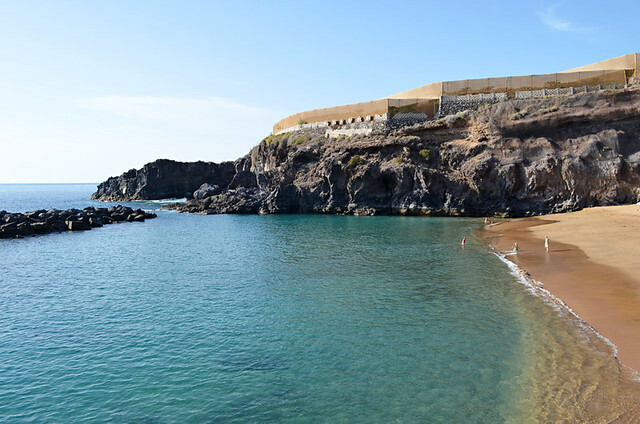 Tenerife’s exclusive beach as it lies hidden from view in the cliffs below one of Tenerife’s top hotels, the Abama Golf & Spa Resort. Golden sand, its sheltered setting and a coastal path to explore make it feel very different from other beaches in the area. There’s no denying it looks the part. However, even though it’s a public beach there’s no escaping the fact that it feels as though it belongs to the Abama. If the lovely new beach at Alcalá lasts it might replace this one as one of our favourites. 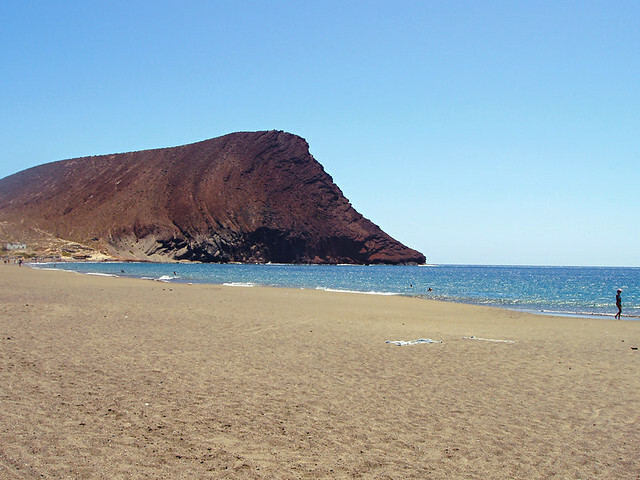 Acres of pale golden sand, a red mountain, loads of space and ideal if you want to go for the all over tan, Playa La Tejita ticks a lot of the boxes that puts it up there as one of the best looking beaches on Tenerife. But this is the east coast, there’s wind… a lot of wind. 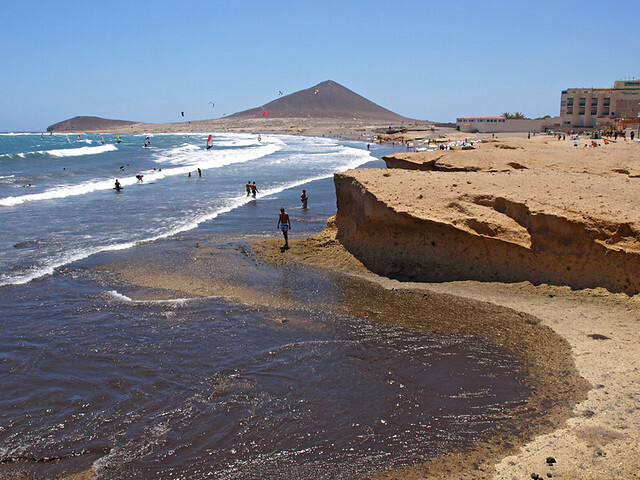 There is more than one beach stretching from El Médano to Montaña Roja, creating coves in the pumice formations and a long stretch of pale golden sand. 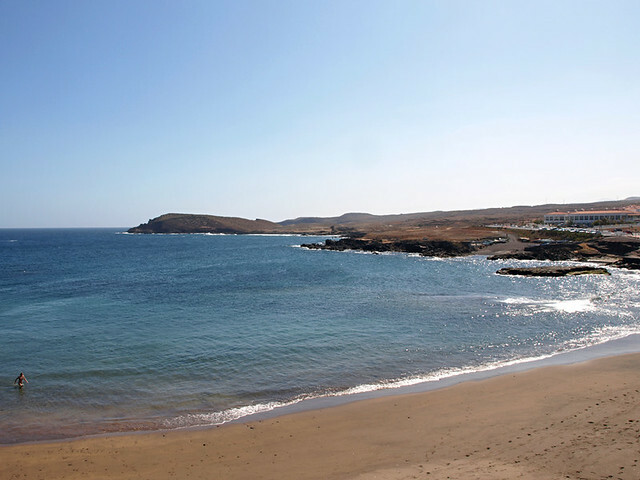 El Médano beach has a wild and carefree feel to it and feels like a local beach. Windsurfers and kite-boarders add splashes of colour to the scene as well as giving sunbathers something to watch. 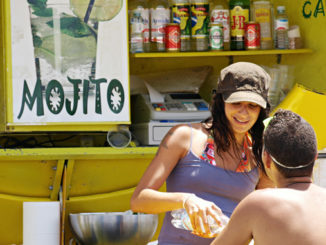 Bars and restaurants lining the beach have a pleasantly surf scene feel. But, like its neighbour Tejita, it’s too windy to make it a great beach. This is the perfect beach for the area often referred to as the ‘upmarket’ part of Costa Adeje thanks to its profusion of luxury hotels. The beach is segregated from the rest of the southern resorts by a rocky outcrop with a mock castle, adding to that air of exclusivity. The sea is turquoise, the beach is white and straw umbrellas, striped beach huts and a colonial restaurant on stilts lend it a personality that mixes south of France with the Caribbean. It’s a beautiful looking beach. The downside? The sand is really odd. 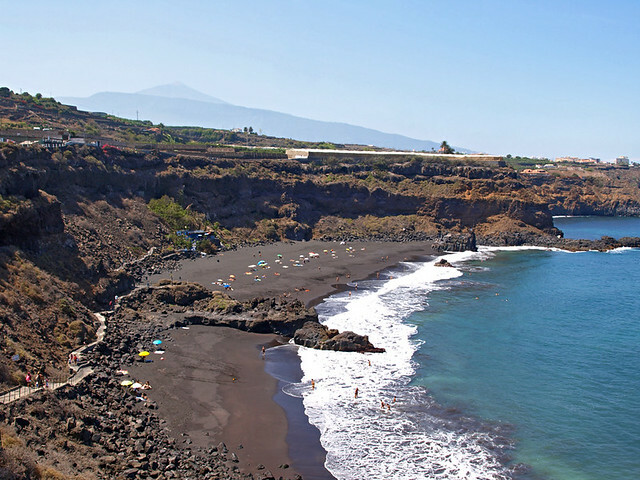 It’s been developed and landscaped with gardens by César Manrique, hence the name ‘Garden Beach’, but this black sand beach at the western end of Puerto de la Cruz gets our vote because it’s a beach that bridges the gap between tourists and locals. It’s a resort beach but parts feel quite wild. 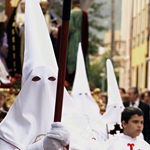 It’s also a community beach and huge fiestas are held on it. Plus it has Mount Teide towering above it. When the mountain is snow clad it is a feature alone that pushes the beach into such a lofty position. The downside is that the sea is often rough (also an upside for strong swimmers). 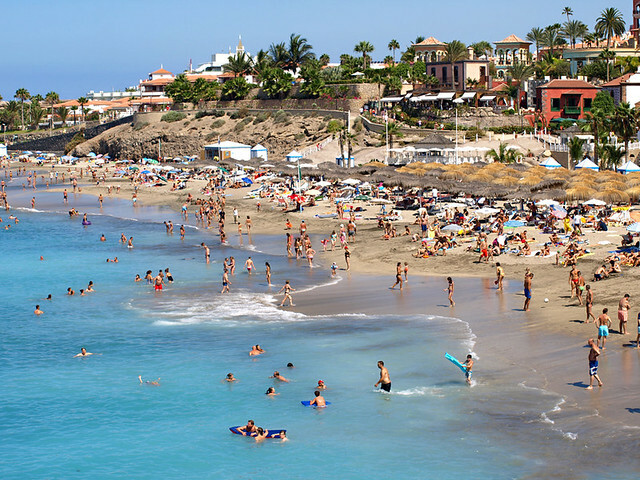 In reality, Playa Bollullo is probably our favourite ‘all round’ beach on Tenerife. There are no hotels backing it, only a beach café, and facilities are primitive. It takes effort to get there and the waves are constantly frisky. All of which are plus points in our book. This is a beautiful looking local beach tucked into the cliffs beyond the banana plantations. This beach epitomises what we think of as the ‘real’ Tenerife. It’s also got two neighbouring beaches that are equally beautiful. It’s man made and often windy so why does Playa de las Teresitas get the number one spot? Because it is the most beautiful beach on Tenerife. It’s the sort of beach that when people see a photograph of it they want to visit. 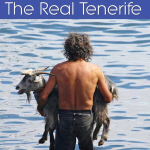 When travel articles in magazines and newspapers print a feature about Tenerife, nine time out of ten times you can bet it will include a photo of Teresitas… even if the article doesn’t mention the place. Golden Saharan sand, a calm turquoise lagoon, palm trees, kiosks selling traditional grub at the rear, loads of space, a stylish Santa Cruz vibe, pretty fishing village next door and an Anaga Mountain backdrop. 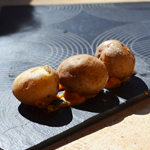 No other beach on Tenerife boasts this mix of juicy ingredients. Loved the article, thanks!. This island is definitely a paradise. I must go visit playa Teresita next time. Hi, Playa Jardin is our favorite. Either to spend long lazy days under the shade of the palm trees, listening to the waves. Or a gentle coastal walk to Punta Brava. I had to Google that one Sonjie. I have been to it but didn’t know its name. 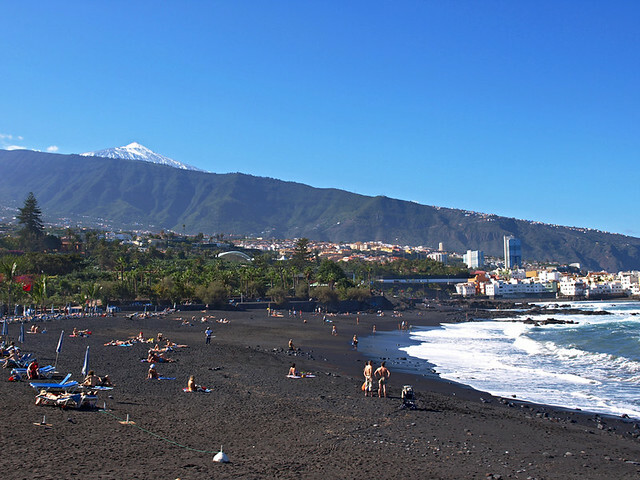 Funnily I’ve just written about black sand beaches for Tenerife.co.uk and one of the plus points for me is exactly as you say – the black sand doesn’t fly about like the imported Saharan stuff, or even the sand around El Médano. Completely agree about Las Teresitas being a nightmare when it’s windy. Las Terisitas is ruined for me by the big rig sitting just off the coast though. I know Santa Cruz is a big working port but it seems odd they would allow such a monstrosity so near to the beach?! I visited Tenerife many years ago: it was my first travel abroad and these beautiful black beaches were an astonishing surprise. For me holidays mean beach! Well, it couldn’t be otherwise: my family live right by the seaside on the east coast of Italy and I used to spend most of the year on our beautiful, fine golden sand beaches. No matter the season, whether in spring, in summer or even in winter, it always feels good to have a walk on the soft sand while listening to the noise of the waves kissing the shore. Then I started to travel abroad. Again, when I say holidays I mean beach! And I was pleasantly surprised to learn how Mother Nature plays with the colours. For me GOLDEN has always been the colour I associated with the beach, but when I first travelled to Tenerife I found myself walking on a BLACK beach instead. The colour is due to its volcanic origins and the contrast with the white of the waves is spectacular. The following year I travelled to Mexico where my eyes were amazed to admire those bright WHITE sand beaches which together with the leaning palm trees and the turquoise of the waters make you feel like in Heaven. However, Hyams Beach, in Australia, holds the record for having the whitest sand in the world. I also had the chance to appreciate the Budelli PINK beach, in Italy, which owes its typical colour to microscopic fragments of corals and shells and the RED sands beach in Canada where the colour is caused by the richness of iron molecules in the sand. We love Playa Jardin as you get towards the Punta Brava end, and also Bolullo … although getting there is a bit trying and forget it if you hate heights!